Two months ago, Camila reviewed an adorable story app entitled Wow! Wow! Wubbzy Adventure: Wubbzy and the Princess, which has three interesting features: mini games, original music videos, and multiple reading modes. My app pick for today is the latest story app from the Wow! Wow! Wubbzy series: Good Night Wubbzy Bedtime Counting. It has all the great features of a typical Cupcake Digital story app, plus a way to teach juniors how to count from 1 to 10. The story starts with a typical nighttime in Wuzzleburg. Throughout the book, you will meet 10 different Wow! Wow! Wubbzy characters. As you visit each character, you will help them go to sleep by turning off the lights and counting objects until they go to bed. When you turn off the lights, the characters will close their eyes and go to bed. A thought bubble will appear, and you're asked to count the objects shown within the thought bubble. For example, when you turn off the lights in Kooky's room, you will see three colorful toys inside his thought bubble, and you're required to count the number of objects by tapping on them. The objects included in each character's thought bubble are of the same type, yet different from one character to another. For example, Walden's thought bubble shows dinosaurs, whereas The Great Grey Smellyphant's shows peanuts. You will visit all popular Wow! Wow! Wubbzy characters, including Widget, Huggy, Daizy, and Wubbzy. Like other Cupcake Digital story apps, Good Night Wubbzy Bedtime Counting includes three original music videos and three mini games that fit the bedtime theme nicely. The first game asks juniors to brush a set of giant teeth. The second game asks juniors to set an analog clock's time by moving the hour hand to match the objective. It uses pages from the book as the game's background and objective. For example, The Main in the Moon will ask you to set the time to nine o'clock, because he counts up to nine stars in the storyline. The last game lets juniors play dress-up in a Pyjama Party. 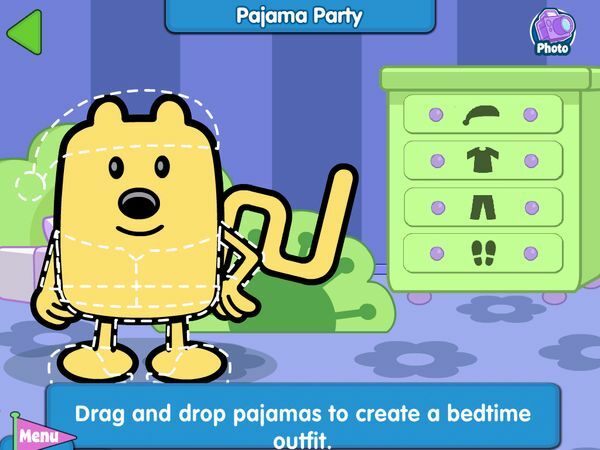 You can combine different night caps, pyjamas and slippers, to find which one suits Wubbzy best. My three-year-old Philip enjoy playing with the Telling Time game and the coloring activity. Two features that I find helpful in the coloring activity are the undo button and the brush tool. It's quite uncommon to see a coloring app with an undo button. The brush tool also makes it easy for younger juniors to make their paintings look really nice. Good Night Wubbzy Bedtime Counting is an adorable story app with a bonus value of letting juniors practice counting from 1 to 10. The interactivity is adorable and the activities nicely themed. The music videos are also fun to watch. It's suitable for juniors ages 2-3 who are just learning to count. Get Good Night Wubbzy Bedtime Counting on the App Store.